Superior material flow and processing require engineered solutions. The negative effects of flow imbalance caused by material shear can significantly reduce your ability to compete. Opti-Flo systems, exclusive to INCOE, are engineered on a custom basis to resolve these issues before production begins. The Opti-Flo design, incorporated into select INCOE manifolds, feature BTI's patented MeltFlipper melt rotation technology. 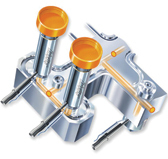 Opti-Flo manifolds are the first scientifically engineered hot runners available on the market. The technology provides homogeneous melt distribution and balanced filling to all cavities while avoiding invasive and restrictive mixers. The Opti-Flo manifold systems replace the common practice of creating melt temperature variations in the nozzles to balance cavity filling. The result is improved cavity- to-cavity consistency and product quality. Complimenting our commitment to advancing hot runner technology, Beaumont Technologies Inc., developers of the MeltFlipper melt rotation technology, compliments INCOE's R&D program. The exclusive global partnership is designed to further the development of melt management technology in hot runner systems. BTI continues to accelerate further development in the unique and new understanding of shear effects on injection molded products and how to maximize the effects for improved performance in INCOE’S hot runner systems. Systems can utilize either our threaded DFQ nozzles, or our compression fit DFX nozzles.